Early 19th century architect/builder Isaac Damon (1781-1862) built the house at 46 Bridge Street in 1813 to be his own family residence. Damon had come to Northampton from Weymouth, MA, in the spring of 1811 to work on a new building for the First Church of Christ. His first wife had died in 1812, and he married a local woman, Sophia Strong, and settled permanently in Northampton. In this house, Isaac and Sophia raised six children. Their daughter Jane and their grand-daughter Jane Damon Smith also made this house their home. A rear wing was added at some time before the Civil War, and later still a small additional kitchen. In 1943 the house came to Historic Northampton. The modern Damon Education Wing was added in 1985 on the site of the original carriage house. Damon was neither the architect nor the principal contractor for First Church of Christ's fourth meetinghouse, but he nevertheless became associated with the structure and gained sufficient recognition to sustain a long building career in the Connecticut Valley. Damon built the meetinghouse from a plan supplied by Asher Benjamin. When the principal contractor, Peleg Kingsley, withdrew from the project, Damon assumed responsibility for the building, which he completed in November 1812. One month later, the Hampshire County Court of Sessions approved Damon's bid for the Hampshire County Courthouse, a brick building with a classical facade to stand with First Church on meetinghouse hill. 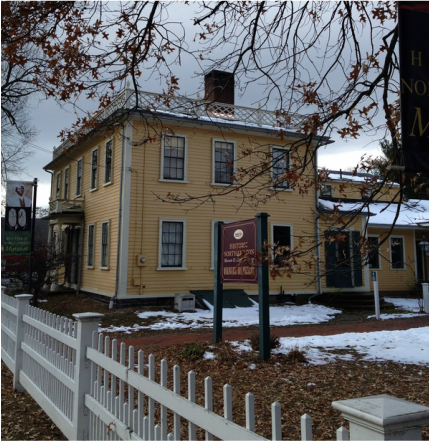 Damon would build one more building on meetinghouse hill, the 1814 Town Hall. Above, the Isaac Damon House in 2014. Below the Isaac Damon House in the 1860s. 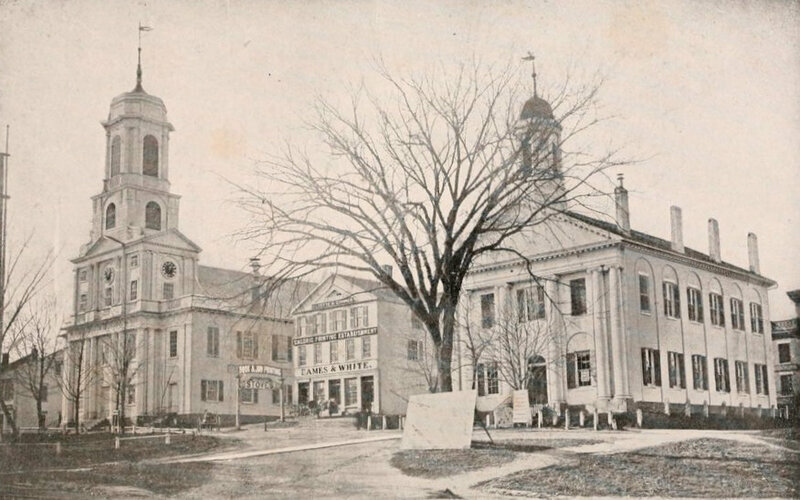 Isaac Damon's 1812 church and courthouse as they looked in a photograph taken in 1864. The church burned in 1876, the courthouse was replaced in 1886.